Designed by DG Pelli, JB Robson and AJ Wilkins because they see contrast sensitivity as a realistic assessment of how well the patient sees large faint objects. The testing of contrast sensitivity on a regular basis is key to detecting early signs of diseases such as Parkinson’s, Glaucoma and Cataracts. By testing with several different contrast levels configured together, the patients sensitivity level is better assessed and records will be more precise. This chart organizes letter sequences into groups of three (triplets) with two triplets per line. Within each triplet, all letters have the same contrast. The contrast decreases from one triplet to the next, even within one line. The Precision Vision Pelli-Robson chart also follows the luminance, font, and letter spacing recommendations of the Committee on Vision of the National Academy of Sciences and National Research Council. 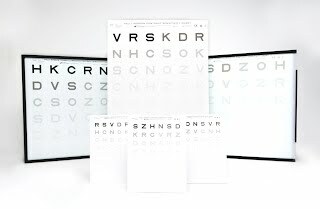 The trans-illuminated versions are identical to the original “Gold Standard” Pelli-Robson Contrast Sensitivity Charts. These charts cover 3/4 of the original range and are manufactured to the same true log steps and use the same letters and letter sizes as the originals. Trans-illumination has the advantage of uniform fixed illumination and eliminates the need for staging the room and verifying chart luminance with room lighting. These charts require using our ETDRS Illuninator CatbinetTM , Cat. No. 2425.